Manually turning data on cyber attacks, vulnerabilities, and exploits into actionable threat intelligence requires a significant investment of time and resources. With security talent and budget in short supply, you need to get more from your data, faster. 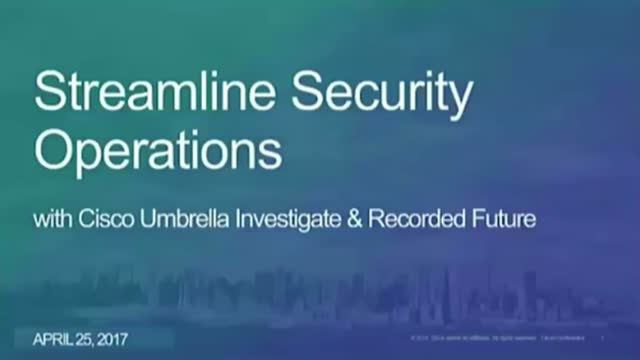 Join Dr. Dhia Mahjoub, Principal Engineer of Cisco Umbrella Research, and Daniel Hatheway, Senior Technical Analyst at Recorded Future, to see how you can gain a more complete view of the threat landscape through a new, exciting integration. -Cisco Umbrella Investigate provides access to a live view of domains, IPs, ASNs, and malware file hashes, enabling incident responders to pinpoint attackers’ infrastructures and predict potential threats. -Recorded Future expands upon the Investigate data from technical, open and dark web sources to further reduce the risk of attackers in the shortest amount of time. -Together, they automate threat intelligence across the broadest set of sources to provide the single best defense against threats. Register today to see how you can make more informed decisions, faster. Join us for a discussion with Steven McLean, Sr. Manager, Global Information Security at Ortho-Clinical Diagnostics, Artsiom Holub, Cisco Security Researcher and Meg Diaz, Sr. Product Marketing Manager, Cisco Cloud Security, as they discuss and debate how they use threat intelligence to transform the incident response process, reduce dwell time, and cut response time for better security.